Summer always makes me think of key lime pie! I associate key lime pie with Florida vacations because I was on vacation in Destin, Florida the first time I ever eat key lime pie. It has been one of my favorite desserts for many years since. When I came across this recipe for key lime pie cookie cups, I knew I would have to try them myself. They would make the perfect party food, appetizer or dessert. Snack size treats are truly anytime treats! Because they are made in a mini muffin pan, they would be the perfect size for a single serving dessert. I always enjoy serving desserts that do not require cutting slices to serve, which allows me to get back to the dinner party faster. Single serving sizes are also wonderfully self-serving. 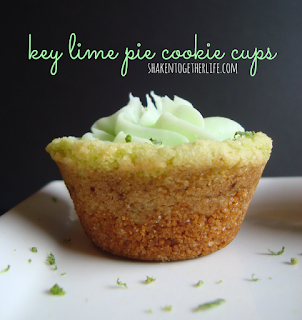 The recipe for these fabulous Key Lime Pie Cookie Cups is published on Shaken Together. Keri introduced me to the Pillsbury Key Lime Cookie mix in her article. Using that mix, she shares how she created these beautiful and tasty treats. She even shares photos showing how she molds the cups, which makes it very easy to emulate. Once the cookie cups are baked, she simply tops them with her key lime frosting using a star tip. I have no doubt these Key Lime Pie Cookie Cups will end up being a favorite in your home and for your parties too. You may have to hide a few just so you get some yourself! If the Pillsbury cookie mix is not readily available, you could use the Key Lime Cookie Recipe published on AllRecipes.com and the Key Lime Buttercream Frosting recipe on MyRecipes.com.